Kaya has a home! 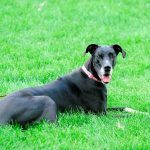 - Rocky Mountain Great Dane Rescue, Inc.
Kaya has a home with her new family in Arvada, CO. This will be Jutta and her daughters first Great Dane! Jutta is looking forward to taking Kaya for nice walks around her neighborhood and her daughters are as well. They’ve done loads of research on the breed and are ready to start training and obedience classes to start off on the right foot with Kaya. Way to go sweet girl!